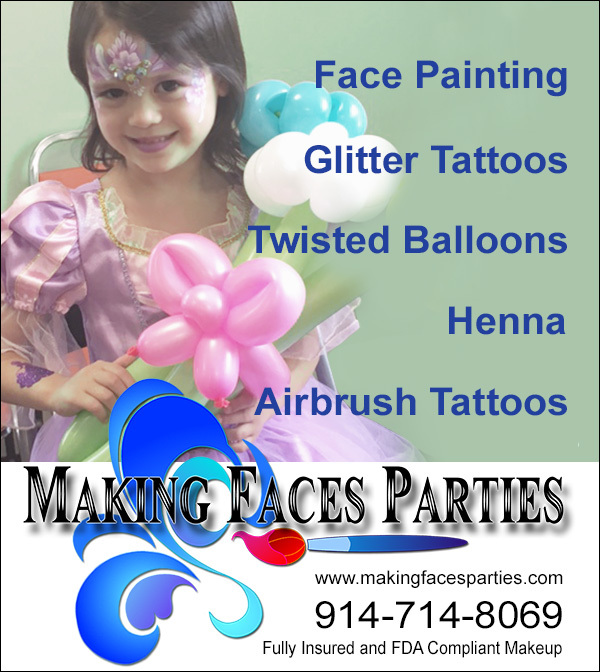 Spotlight: Twist Up Some Fun with Making Faces Parties! Another year, another birthday party! Westchester’s party spots are quickly approaching wedding venue status when it comes to advance booking (ever try to reserve Stew’s?). It’s never too soon to lock down birthday plans. Which is why we want to tell you about Making Faces Parties, the face painting, glitter tattoo, balloon twisting barrel of fun brought to you by Margie Nugent! 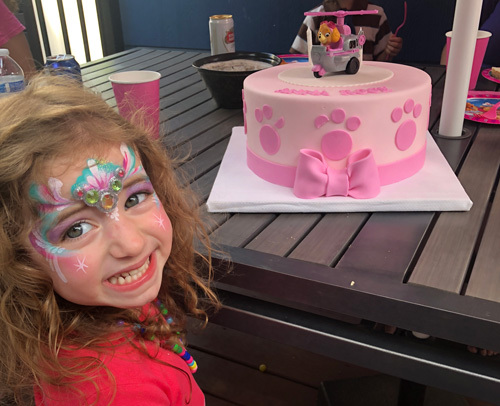 She turned our daughter’s backyard party from Basic to Beyond with her amazing face designs that delighted girls and boys alike. You wear a lot of hats. What's your favorite thing to do at parties? My favorite thing to do at events is to exceed expectations. Whether it’s face paint, henna or any of the services we offer, I get my joy from creating art on the spot and blowing away the recipient. I love people and I love art so to me it’s the best job in the world. How did you get into face painting? I was always crafty, and I majored in Art. My previous career was as Design Director in the costume jewelry industry in NYC. But then life happened and I found myself in a new place with two sons to raise. I answered an ad on Craigslist and convinced a local magician that I could face paint with absolutely no prior experience. It turns out I could! I fell in love with interacting with kids and being able to make art again. I became obsessed with learning everything I could to become the best at what I do. Ten years later, I have received many honors and awards for excellence in business. I now travel on a regular basis to conventions to teach others in my field. What are your favorite designs to do? My favorite designs are the ones I know that will make someone’s day. Whether she wants to be a princess or he wants a skull, it needs to be the best they have seen. Sometimes it’s an arm design in honor of a family member—I find those the most touching. Do you have any tips for parents to make a party go smoothly? In ten years I have been to a lot of parties. I can easily say your entertainment can make or break your event. Plan ahead and get a feel for the entertainer’s schedule. Ask them questions about availability and themes you may be interested in. Children under three for the most part don’t like face painting (plus, the makeup is not approved for their skin), and children over eleven may like henna more. A few questions early on can help you plan the perfect party. While it’s true not every child will want to get their face painted, you need to plan your time as if they will. Just like pizza, some kids will want three slices and some may not eat any, but you still provide enough food as if everyone will eat. If you are planning an event outside, have a shaded area available and an indoor spot in mind just in case the weather turns bad—thinking about this ahead of time will save you stress the day of. If your event will happen during a peak period such as Halloween or Communion season, the sooner you get in touch the better, believe it or not I start getting Halloween bookings in May! Whomever you decide to hire should be accessible for questions, provide a contract to capture all the important information, be fully insured, and only work with the best possible products. I recommend starting the event entertainment no more than half an hour after your guests arrive and stopping it right before you cut the the cake for an easy transition to the conclusion of your party. If you are having an event in a catering hall I recommend a minimum of 2 hours of entertainment so the children can be entertained while the parents have the opportunity to eat and socialize. Relax and have fun! This is the good stuff in life. Get lots of pictures. The small hiccups the day of might become the memories you share for years to come. I absolutely love my clients. I get to watch their families grow, and getting stopped in the supermarket when their kids recognize me—it makes me feel like a celebrity. Thank you, Margie! If you’d like to find out more, go to MakingFacesParties.com. That's it for this week! Don’t forget to check out our exclusive list of every children's library program in Westchester. Some programs have changed slightly from Fall to Winter, so check the library’s calendar to be sure the event you want to attend is still happening. And for more special events every day, follow us on Facebook and Instagram. Thinking about summer programs? Read our tips on how to find the perfect camp! If you like what you're reading, please sign up for our once-weekly email of events and ideas in the wonderful world of Westchester parenting.